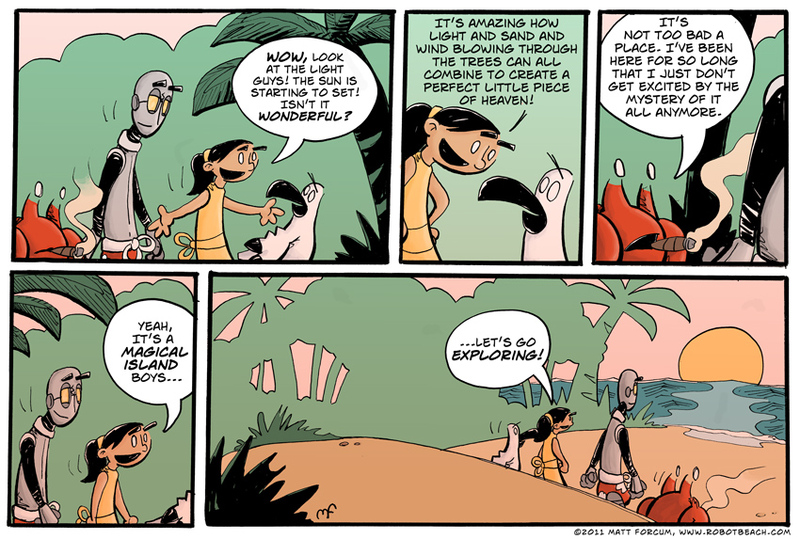 Robot Beach by Matt Forcum - A comic about life, loneliness, and robots. One year ago today, to this very moment, my wife and I was getting settled into a hospital room and waiting nervously for the doctor to arrive and brief us about the plans for the next day’s surgery. Earlier that day my wife had received the phone call telling her that her new Kidney and Pancreas had arrived and a year of daily dialysis treatments and 15 years of diabetes was going to soon be but a memory. We knew our lives were going to change in a drastic way, what we didn’t realize was that change wasn’t going to be all positive. Twelve months and over a dozen hospitalizations later we now find ourselves facing yet another surgery and yet another long recovery. The focus of my life has certainly changed this past year. Hospital bills have forced me into “must-make-as-much-money-as-possible” mode and so most of the more relaxing and pleasurable things in my life have been put on hold. This includes Robot Beach. So what is the future of Robot Beach exactly? When will it be coming back? I don’t really have a good answer for that. I’ve got big plans for what I want to do and where I want to take this little cartoon world I’ve built for myself, but until I have a better idea of when I’ll be returning I’m going to keep it to myself. Thanks again for your patience! I’ll be seeing you all soon enough! 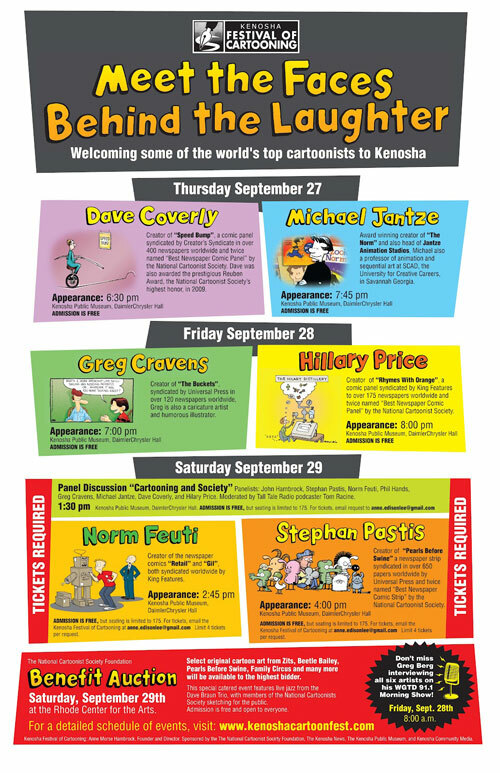 It’s finally september and the Kenosha Festival of Cartooning is starting to wind up. (I’ll be heading down on Saturday the 29th with Adam Huber of the always hilarious comic: Bug.) They’ve recently released a number of new posters and I am getting excited! Click here to check out all of the posters. Here is a worthy Kickstarter project for you guys. The Kenosha Festival of Cartooning is currently trying to raise funds to keep their festival free and open to cartoonists and friends of cartooning. It is a three day event full of presentations, workshops, panel discussions and more! Recently the National Cartoonist Society Foundation contacted the organizers and offered to match up to 10,000 dollars of Kickstarter donations. This means that thanks to their generosity, your donation is worth TWICE as much as before! There are great rewards available for donating, so please consider giving today. Please take a moment and check out their Kickstarter page here.